A gallery of all photos from this day can be found here. Over the last couple of weeks we've been looking at parts of a trip to Florida in December. So far we have spent an evening in Jesup, Ga., and checked out the street running in Augusta, Ga. This time we are going to chase one of those classic southern short lines, the Pickens. The Pickens opened between Easley and Pickens, S.C., in 1898, and operated just on those ten miles of track for almost a century. In 1991, as part of Norfolk Southern's Thoroughbred Shortline Program, the Pickens added NS's line from Honea Path to Belton; it further added from Belton to Anderson in 1994. Meanwhile, traffic on the original Pickens had dried up, leaving only a locomotive rebuilder in the town of Pickens by 2002. Finally in 2013, the original Pickens was shut down and the rails removed. Today's Pickens is over 28 miles long. It interchanges with Norfolk Southern in Anderson, and also sends interchange traffic to CSX via the Greenville & Western at Belton. A new shop has been built on the outskirts of Anderson, where a fleet of U18B locomotives are maintained. 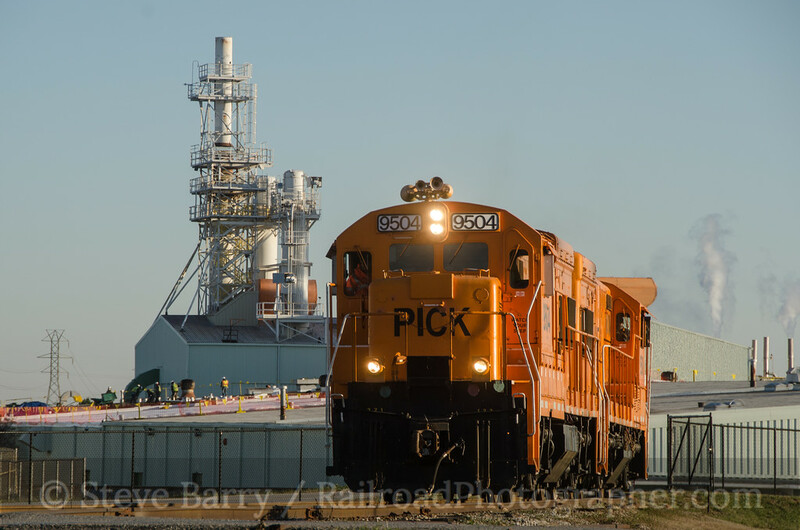 On December 13, we chased the Pickens as it performed its daily duties. 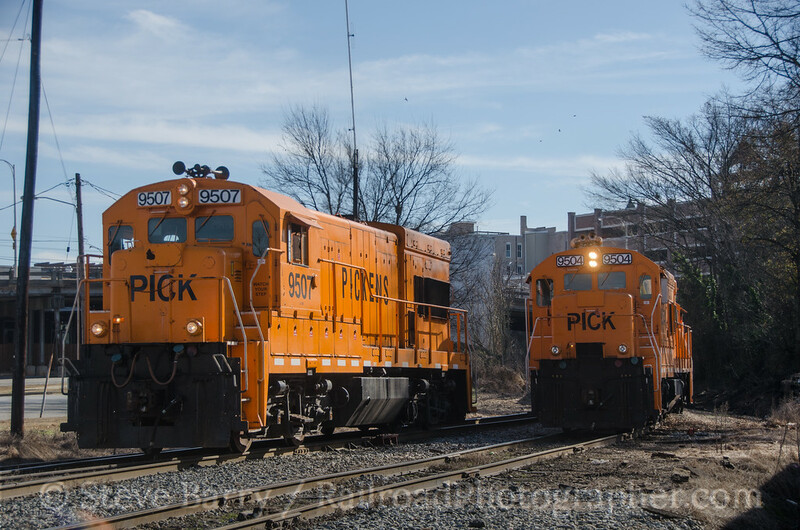 A pair of the U18B's (built by General Electric and purchased second-hand from CSX) left the shop to work three large industries in the area. The locomotives first ran light to the Owens Corning mill to pull one car out (above). The crew dropped the one car at a (very) small yard not far from the shop, then took off up a branch to pull cars out of the Electrolux plant (above). A Michelin plant is located further up the line, but rather than push the cars from Electrolux all the way up the branch, the crew returned to the small yard, dropped those cars, then headed back up to Michelin to pull cars from there. 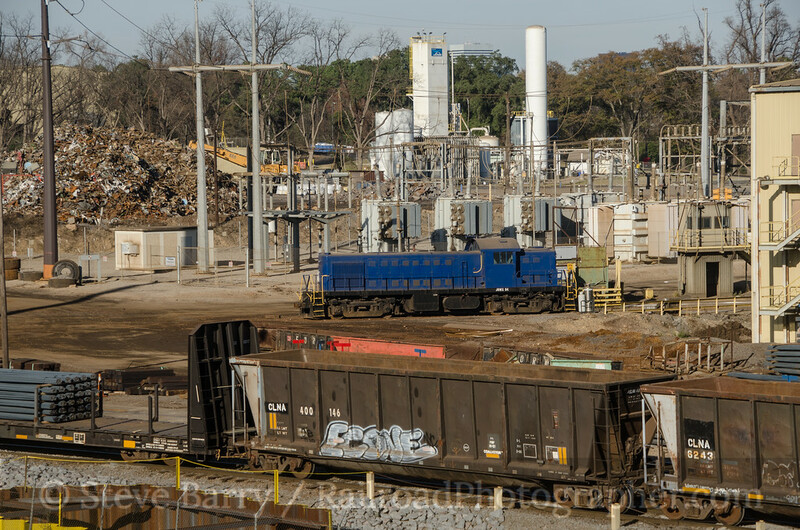 Once done at Michelin, all the outbound cars were assembled and the train began its run to the Norfolk Southern interchange behind the "Baby Boats." Okay, why are U18B's called "Baby Boats?" When General Electric introduced its "Universal" line of diesels they were given a "U" prefix. As such, the entire line of locomotives became known as U-Boats. While most U-Boats were known as large workhorses, the U18B model was the smallest of the line. Thus, they became known as "Baby Boats." In downtown Anderson the train met the other job on the railroad, the one from Honea Path and Belton, which had a single U18B. The two trains shuffled cars around, with both leaving some cars for the Norfolk Southern and picking up some NS cars. Cars bound for CSX were handed to the Belton job, while the Belton job handed off cars from CSX bound for the industries west of town. Finally, everything was sorted out. 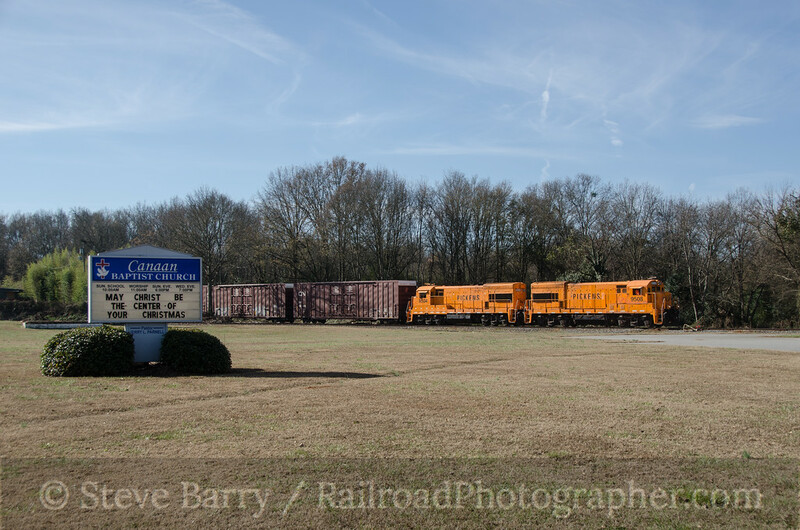 The Anderson job headed back west, passing the Anderson Cotton Mill as soon as it left the NS interchange. The mill was built in the 1880s; sadly, it burned in 2007. Meanwhile, we headed over to Belton, home of the Greenville & Western. The Pickens interchanges with the G&W, which in turn delivers the Pickens' cars to CSX near Greenville. The G&W runs two immaculate GP9s on its trains, and we had plans to chase these later that afternoon. Unfortunately, the two Geeps were being readied for Santa Claus trips the next day and would not be running. 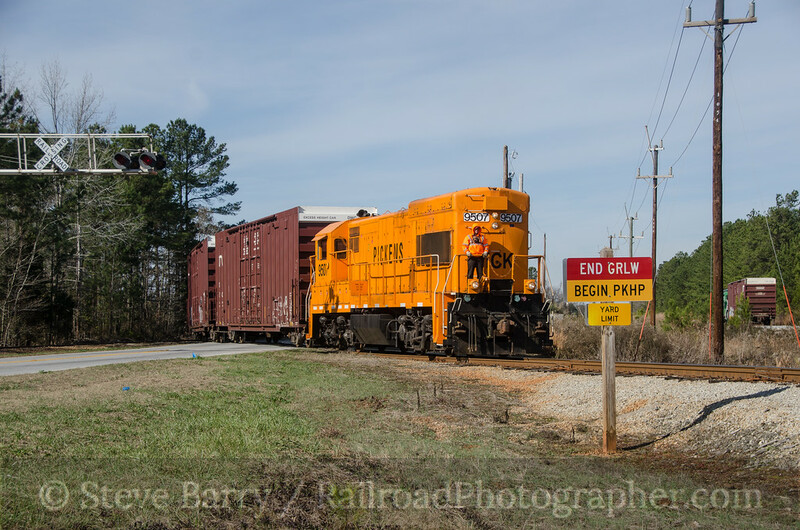 Instead, a GP30 from the Aiken Railroad (a sister road to the G&W) would be going to Greenville, and it would be running long-hood forward -- not good for photography. 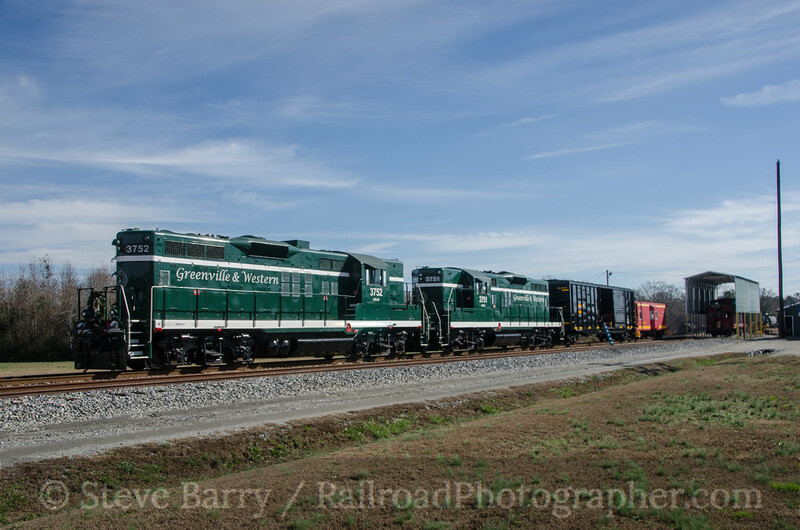 We did shoot the GP9s being readied for Santa service. Speaking of long hood forward, the Belton job on the Pickens -- with the single U18B -- was also returning long hood forward, so we didn't bother chasing it from Anderson. 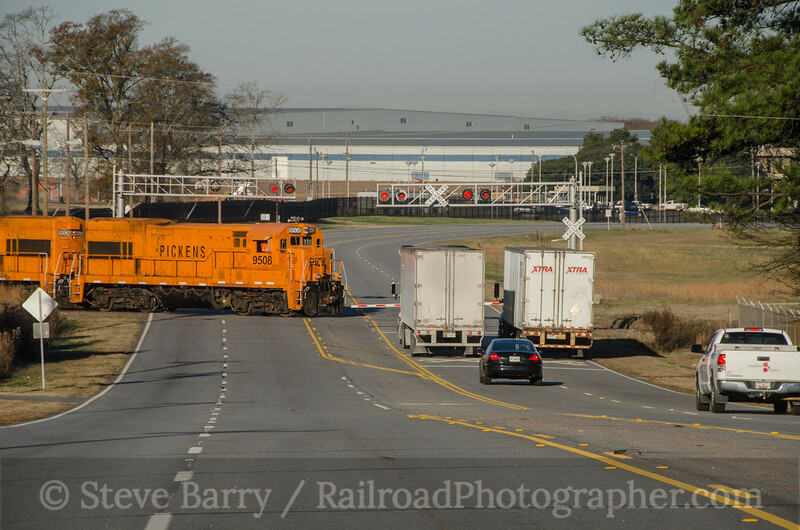 As we were finishing with the G&W, it showed up in Belton to drop cars heading for CSX at the interchange. As it turned out, everything it brought from Anderson was CSX-bound, so only a light engine -- running backwards, no less -- would be continuing on to Honea Path. Faced with chasing one of two backwards locomotives (the Pickens or the G&W), we headed out of Belton with another quarry in mind. 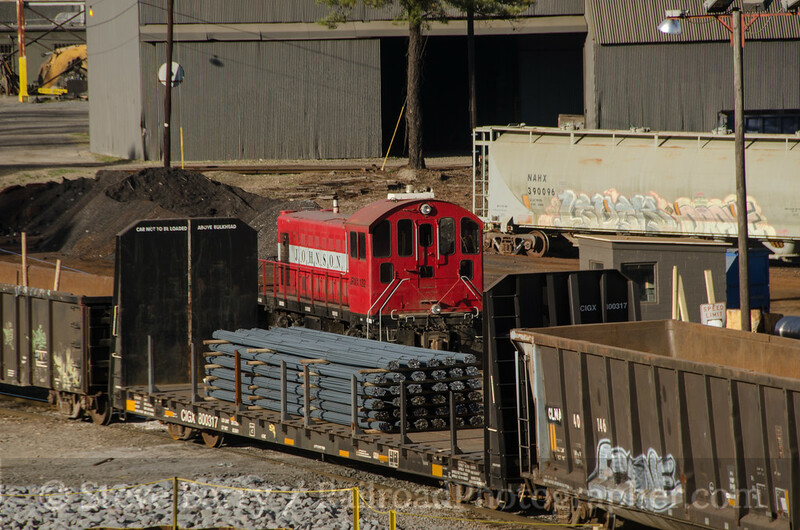 CMC Steel in Cayce, S.C., uses a pair of switchers built by the American Locomotive Company. 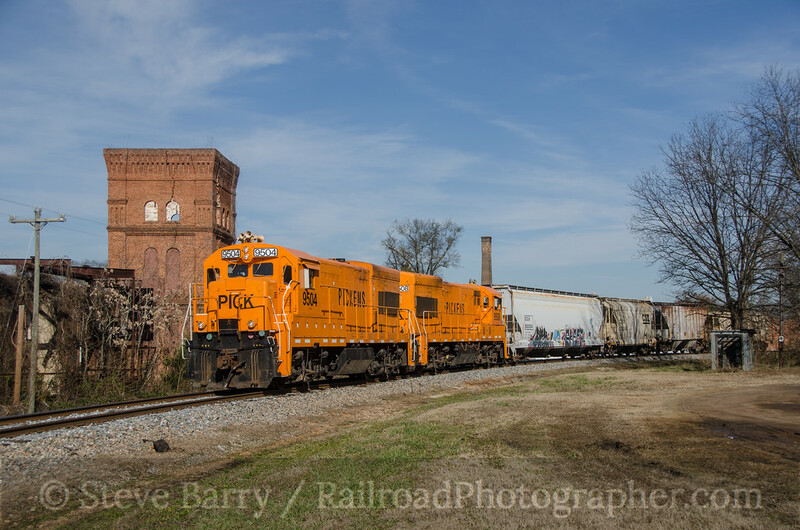 With a little bit of luck, you can shoot both locomotives together from the 12th Street Extension bridge in Cayce. Unfortunately, luck wasn't with us -- a cut of cars on the closest track blocked getting a view of both locomotives. An end-cab switcher was working, and it was possible to get it playing peek-a-boo as it shuffled around behind the annoying string of cars. A larger road switcher was parked further back in the plant, however, and made for a nice shot nonetheless. It wasn't quite what we were after, but it was better than nothing. That put the finishing touches on a busy day. We would do some night photography later on, but that's another post.